At 2:30 PM I realized I had forgotten the tickets. We were just finishing a 7k hike with some friends on Lantau, having a snack at a picnic table. 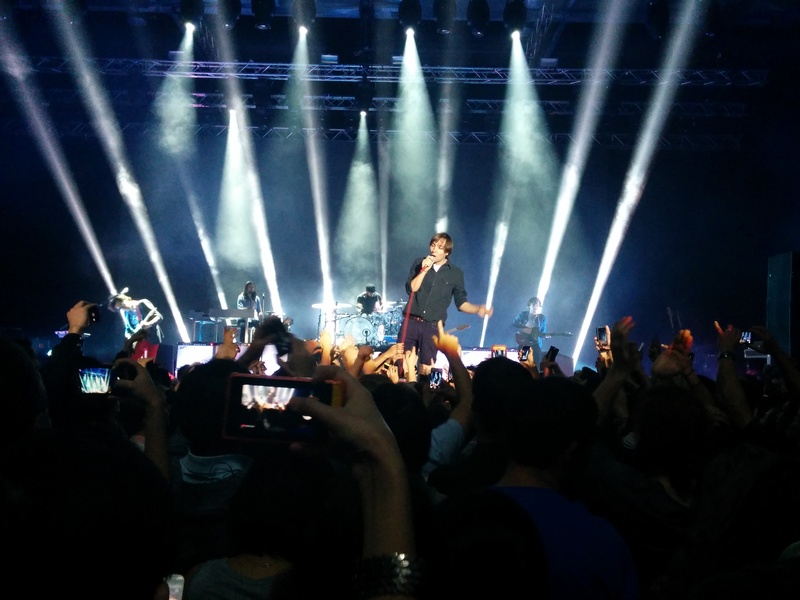 The Phoenix concert was at 7PM at the Asia Expo Center, also on Lantau, near the airport. Now we were going to have to go back to Hong Kong Island, and then come back to Lantau. Oh well. We ran back to our friend’s house while they continued the hike, then caught a bus, then got the ferry, then the train. We cleaned up, dropped our bags, ate some take away and left within 45 minutes. I didn’t want to be late. The last time I went to a concert there (The Killers) they started exactly on time. Absurd. 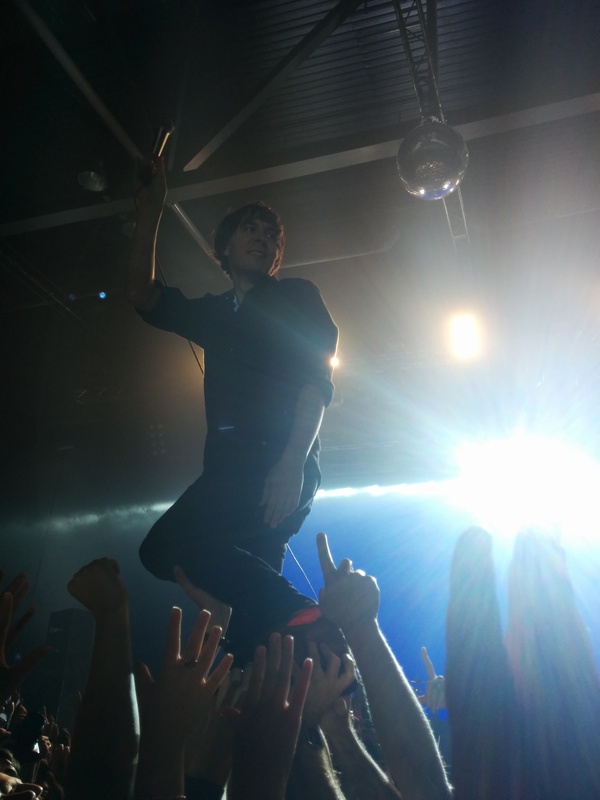 But Phoenix was amazing when I saw them in Boston, and I couldn’t miss it. We sped to Hong Kong station and got our airport express tickets. We arrived at about 7:20, and the opener (a dj group) hadn’t even started. It was another hour and a half before the band came on. Tired from lack of sleep, hiking, and all the trains, we stood with our friends. The djs ended their set with a selfie on their smartphone (really?) and then it was just the set up. People in the crowd were restless. Every time a roadie came on stage they would cheer, until it started to be boos after we’d waited too long. The one thing I don’t like about concerts is all the waiting around. One surprise for me was their purely instrumental number, backed by a video moving through the streets of Paris. The song just built up the beats constantly, pulling us through the city. Then in the encore the crowd surfing started. For the first encore song, he sat down on a railing and sang an acoustic ballad, during which a few fan crazed girls clambered over and tried to touch him as if he were a saint. Then the rest of the band joined in for an older song of theirs and a rendition of Rome when lead singer ended up riding out into the audience. He finished the show standing on upraised hands about one meter from my face. Amazing. This is why I love Phoenix. 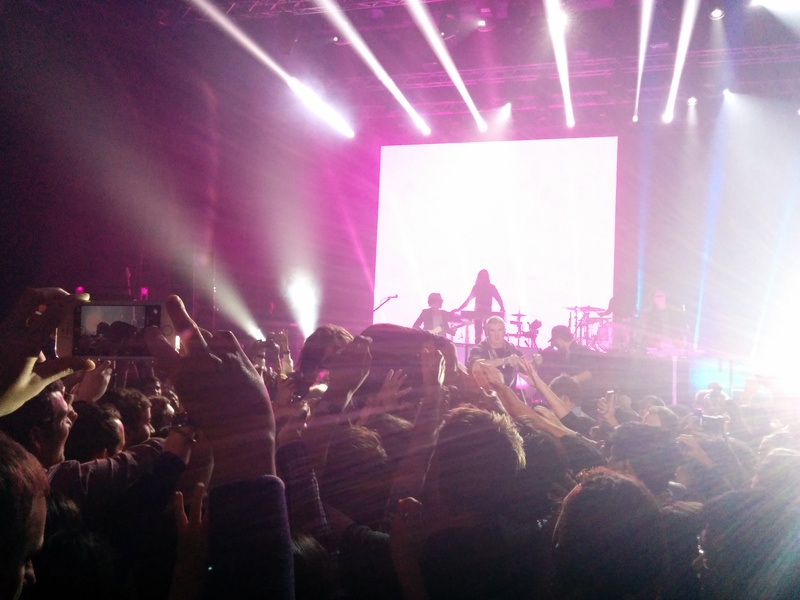 They play a crowd, they enjoy it the entire time, they don’t simply rely on vocals. They are fabulous musicians, with amazing showmanship. Seeing them live makes me love their music. However, after the encore, we promptly boarded a train and went to bed. An hour and a half of dancing does not make one less exhausted.